Seventeen… Love Rocks or other little random yarny/sewn gifts. I could claim that this goal has been completed, having put dozens and dozens of hearts in the community garden in Chorlton last Saturday, but I’m only counting this as one ‘act’. I also made a little vaark which was sent as a surprise to one of the administrators for the 60 Million Trebles project. Thus, the total so far is six. Sixteen… batches of homemade biscuits. Three lots in May means I’m just a single batch away from my goal. Thirteen… mends. Leggings, pyjamas and two different sets of headphones this month means that I’ve reached my target for the year. Twelve… letters to friends. None written this month, so the total is still six. Eleven… new items in my Etsy shop. I’ve added just one item this month, the “Start a Revolution, Plant a Garden” embroidery that appeared in the craftivism display. This takes the total to eight. Ten... plants given to good homes. Although I only gave the first plants away last month, I’ve already reached my target, with summer purple sprouting broccoli, lemongrass and chillies accounting for most of the plants that have gone off to new homes in May. Nine… games of Scrabble. None yet. Eight… meals using only our own produce. None yet, although there have been several meals that came close. Seven… visits to see “social media” friends. My visit to Manchester took my total to six. Five… book chapters written. None yet. Four… blankets for charity; knitted or crocheted. I’d completed this target by the end of February; however, I finished another this month and I’ve nearly finished one more. Three… sessions in the loft, sorting out some of the accumulated ‘stuff’ up there. None yet. Two… patterns published and on sale. No new pattern this month, so just the one published in January. One… gardening apron. I made this last month. I’m feeling rather pleased with my achievements this month – how about your projects this year? If you have a 17 for 2017 blog post or an update on your progress, do leave a link in the comments. 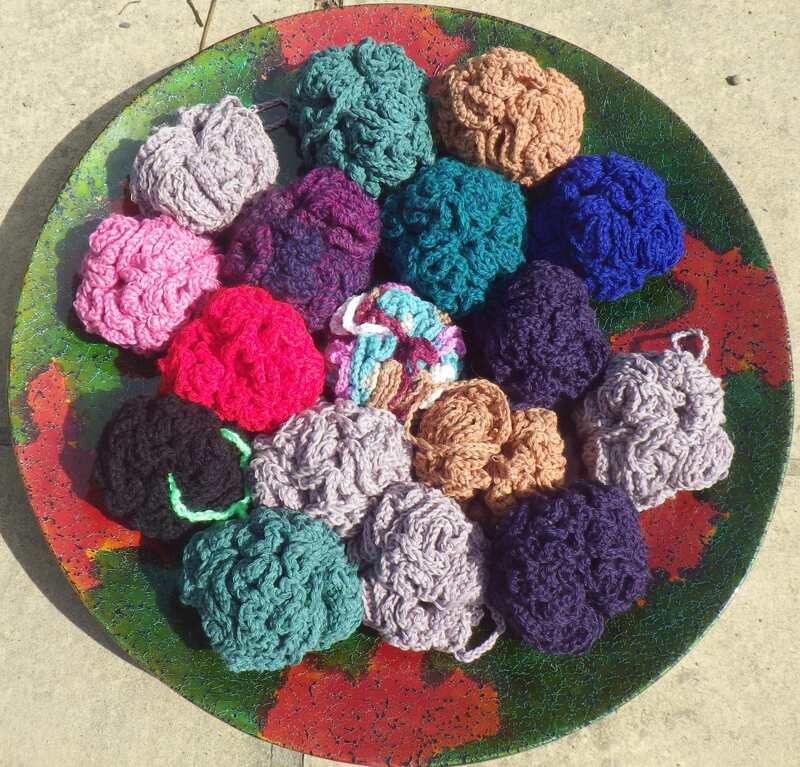 Seventeen… Love Rocks or other little random yarny/sewn gifts. I crocheted a little collection of flowers and hearts for the craftivism display at The Make It Shop, to be given away at the end of May. Although there were seven of them, I’m just counting this as one ‘make’ on my list. Most unusually, I completely forgot to photograph them, but I will do so once they are in the display. This takes me to a total of four for this target. Sixteen… batches of homemade biscuits. Just one batch in April takes the annual total to 12. We took this batch on holiday with us! Fifteen… cheeses. I experimented with making a new sort of cheese this month, using a thermophilic bacterial starter. It is smelling very good, so I hope that April’s solitary cheese will be a success. The total has now increased to seven. Fourteen… pairs of knickers. None this month, so the total is still six. I have decided I need to tweak the pattern a little as I have lost a bit of weight! Thirteen… mends. Two mends this month – both involved using Sugru to rescue damaged plastic items, namely a bucket and a coat hanger. This takes me to nine different mends so far this year. Eleven… new items in my Etsy shop. I haven’t added anything this month, The current total is still seven, but I’ve got some new ideas. Ten... plants given to good homes. Finally kicking off this aim, I gave away two tomato plants this month to the friend who looks after our hens when we are on holiday. Nine… games of Scrabble. None yet… we took the Scrabble set on holiday, but somehow it never got used. Eight… meals using only our own produce. None yet, although plants are flourishing in the limery now, so the future looks bright. Seven… visits to see “social media” friends. One lovely visit to see Karen of the blog Sweet Baby Veg – more about this in a later post. My total is now five. Six… Pairs of socks knitted, using at least three different patterns. I planned to knit a pair of socks whilst on holiday, but I could not find the right needles before I went, and so I didn’t manage even to start a pair. Of course the needles turned up as soon as I got home, so maybe I’ll do better this month. The total is still just one pair. Five… book chapters written. None yet – I’m still not feeling inspired! Four… blankets for charity; knitted or crocheted. I’d completed this target by the end of February; however, I have another one underway at the moment – it’s the project I took on holiday in the absence of sock needles! Three… sessions in the loft, sorting out some of the accumulated ‘stuff’ up there. None, but now the weather is warming up, the prospect of this happening is increasing. It’s a bit grubbier than this now! One… gardening apron. Yay – this one is done, and it’s getting lots of use. Progress has been a bit slow this month, but I’m still moving forward – how about your projects this year? If you have a 17 for 2017 blog post or an update on your progress, do leave a link in the comments. Seventeen… Love Rocks or other little random yarny/sewn gifts. I have managed two contributions this month: hopefully my yarn bombing for Sixty Million Trebles reached a few people, plus I made Petunia vaark who has gone off to live with a new friend in Lancashire. This takes my total to three – I think vaarks may feature quite prominently in growing this target! Sixteen… batches of homemade biscuits. Four batches in March means that the annual total is already 11. The best thing to report, however, is that we have not bought any packets of biscuits at all, so there has been no palm oil consumption. Fifteen… cheeses. One regular hard cheese plus two alpine cheeses this month mean that the total has increased to six. The regular cheese has been waxed to allow it to mature without further intervention, but the alpine cheeses are being washed regularly with locally produced honey ale to control the natural mould growth – these are supposed to be ready to eat after six weeks. Fourteen… pairs of knickers. Only one pair made this month, bringing the total to six. However, I have now got some more organic cotton jersey fabric, so there’s cutting out to do. Thirteen… mends. One pair of slippers and one pair of socks have been darned this month. I’m trying to keep on top of mends as they crop up, and this approach seems to be working well so far and I’ve now mended seven garments this year. Eleven… new items in my Etsy shop. I haven’t added anything this month, but I have sold a couple of items, which wouldn’t have happened if I hadn’t listed them in the first place! The current total is still seven. Ten... plants given to good homes. None yet – but it looks like I’m going to have plenty surplus as the year progresses. Eight… meals using only our own produce. None yet, although we’ve eaten lots of kale, broccoli, mizuna and eggs from our garden! Seven… visits to see “social media” friends. We met up with a whole bunch of Twitter friends a couple of weeks ago, taking my annual total to four. I’m currently in the process of organising a visit in April, one in May and looking at a get-together at the end of July. If all three of these work out, then that will take me to my target number. Six… Pairs of socks knitted, using at least three different patterns. I made my first pair of the year this month using my old-faithful pattern… I just couldn’t work up the enthusiasm to try a new pattern. Five… book chapters written. None yet – I’m just not feeling inspired! Four… blankets for charity; knitted or crocheted. I’d completed this target by the end of last month. I haven’t made any more in March, but various friends have given or are about to give me yarn and squares, so there are going to be more blankets in coming months. Three… sessions in the loft, sorting out some of the accumulated ‘stuff’ up there. None, although a plan is afoot to increase storage space in the kitchen and then we can have a good sort-out of all the preserves and preserving equipment that’s up there and currently quite disorganised. I have also given away a couple of items, but I’m not being very focussed so far. Two… patterns published and on sale. No new pattern, so just the one published in January – sadly sales of that have been disappointing. One… gardening apron. Not yet, but the fabric, chambray for the outside and poplin for the lining (not denim in the end – I had a change of heart) has arrived and this is something I’d really like completed soon because I want to use it! So, it’s progressing well – how about your projects this year? If you have a 17 for 2017 blog post or an update on your progress, do leave a link in the comments. Seventeen… Love Rocks or other little random yarny/sewn gifts. I sent off my first of these just the other day. I want it to be a surprise for the recipient (although she knows it’s on the way), so no photograph just yet. Fifteen… cheeses. No hard cheeses this month, but one batch of curd cheese. Fourteen… pairs of knickers. Three more pairs completed this month bringing the total to five. I’ve getting better with the overlocker, so they are getting easier to make. Thirteen… mends. Three this month: the knees of Mr Snail’s work jeans patched again; a hole darned for a friend and a pair of my leggings mended. Twelve… letters to friends. Just one written this month, but that’s ok because I only have to average one a month to reach my target. Eleven… new items in my Etsy shop. I’m delighted to say that there are now seven bird roosts listed – some felted and some made with woollen twine. I haven’t sold any yet, but it’s early days. Ten... plants given to good homes. None yet – it’s still too early in the season. Nine… games of Scrabble. None yet… we seem to have been so busy. Eight… meals using only our own produce. None yet, although we’ve eaten lots of omelettes, making them partial meals from our garden! Seven… visits to see “social media” friends. I’ve managed two ‘big’ visits – first to Manchester, where I saw a whole load of friends who I know via Twitter, as well as my dear Sarah, who I’ve known since I was 18 and my niece Alex; second to Birmingham, where I got together with lots of permaculture friends, most of whom I communicate with via FaceBook. Six… Pairs of socks knitted, using at least three different patterns. None yet… it’s all been about crochet recently. Five… book chapters written. None yet, although I may have persuaded a friend to contribute to the book. Four… blankets for charity; knitted or crocheted. All four done… I will make more later in the year, but I’m having a rest for a while. Three… sessions in the loft, sorting out some of the accumulated ‘stuff’ up there. None – it’s still too cold to venture up there yet! Two… patterns published and on sale. I did one last month, but nothing further this month. One… denim gardening apron. Not yet, but I will try to sort out the fabric in the coming month. So, it’s progressing well – how about your projects this year? If you have 17 for 2017 blog post or an update on your progress, do leave a link in the comments. Seventeen… Love Rocks or other little random yarny/sewn gifts. I haven’t finished any yet, but I’m working on quite a big creation to send as a surprise gift. Sixteen… batches of homemade biscuits. This was under-ambitious for the year – I’ve already made five batches! Fifteen… cheeses. I’m not sure whether I should count one or two here – I made a tomme-style cheese, and then I made ricotta with the whey. I’ve only entered this as one cheese on my spreadsheet, because it was only one cheese-making day. Fourteen… pairs of knickers. Good progress here: two pairs completed and another six pairs cut out and ready for sewing. Thirteen… mends. Two done: some boro mending on the knee of a pair of jeans belonging to Mr Snail and a tear in a cotton tunic repaired using my overlocker. Twelve… letters to friends. In a flurry of activity on a dull and wet day, I wrote five letters! Ten... plants given to good homes. None yet – it’s too early in the season. Nine… games of Scrabble. None yet… we’ve got a bit carried away with watching The Blacklist on dvd to the exclusion of playing games. Eight… meals using only our own produce. None yet, because neither of us fancy kale omelette! Seven… visits to see “social media” friends. One visit to blogging friend Katy the Night Owl. Six… Pairs of socks knitted, using at least three different patterns. Yarn and new pattern at the ready, but none started yet. Five… book chapters written. None, although I’m planning a talk on ecology that will form the skeleton of one of the chapters. Four… blankets for charity; knitted or crocheted. Two completed – one for Knit for Peace, one for Sixty Million Trebles, and two on my hooks. Three… sessions in the loft, sorting out some of the accumulated ‘stuff’ up there. None – it’s too cold to venture up there yet! Two… patterns published and on sale. Bird Roost pattern finished and available as a digital download from my etsy shop. One… denim gardening apron. Not yet – I’ve been dithering about the fabric! If you have 17 for 2017 blog post or an update on your progress, do leave a link in the comments. not because of a fox or other predator. This is quite an early moult, but it’s good because the weather is still pleasant, so she’s not shivering or drenched (yet). As you can see the two new girls are also doing well; they are both laying almost every day… so I’m grateful for their eggs too. Third, tomatoes. For many years I have found it impossible to grow tomatoes. Every year in our old greenhouse I got only a tiny crop before the plants succumbed to Botrytis mould. This year is the first full growing season for the limery, and I’m delighted to report it’s turned the tide and I can now produce my own tomatoes – hurrah! My friend Mrs Robinson visited this weekend. She was here because we were going to a memorial service on Saturday, but stayed to spend a crafty day on Sunday… and what a brilliant day we had. 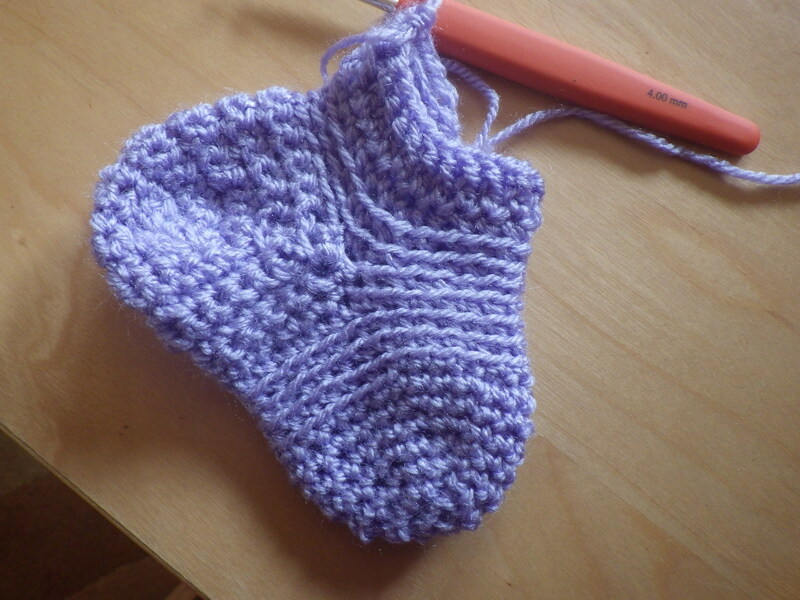 In the morning I taught her how to wet felt and in the afternoon she taught me how to crochet a sock. It’s always lovely to make something useful when you are learning a craft, so Mrs Robinson’s first ever wet-felting resulted in a case for her mobile phone. I showed her how to lay out the fibre, and she did this whilst I made an apple, date and chocolate cake. Then she made a lovely colourful pattern for the outer layer and got to work with rubbing and rolling whilst I made squash and sweet potato soup. By lunchtime, the felt had shrunk down to the right size, and she was able to cut into it, remove the resist and cut it to shape so that there was a flap, before a little more felting to strengthen the edges and a final rinse to remove the soap. Sadly, we were being so sociable that I completely forgot to photograph it… it’s a shame because it turned out really beautiful. After a lunch comprising the things I cooked in the morning plus bread made by Mr Snail-of-happiness, we reversed roles and I learned the principles of crocheting a sock. We didn’t have time to make a whole sock (I had to return her to her family early in the evening), so we made a ‘sock sampler’ which includes all the elements of a sock and which I can use as a reference when I come to create a real pair. I love the idea of a sampler… forget your ideas of a framed piece of cross stitch with the alphabet and some twee or religious quote. A real sampler is simply a representative collection of something. 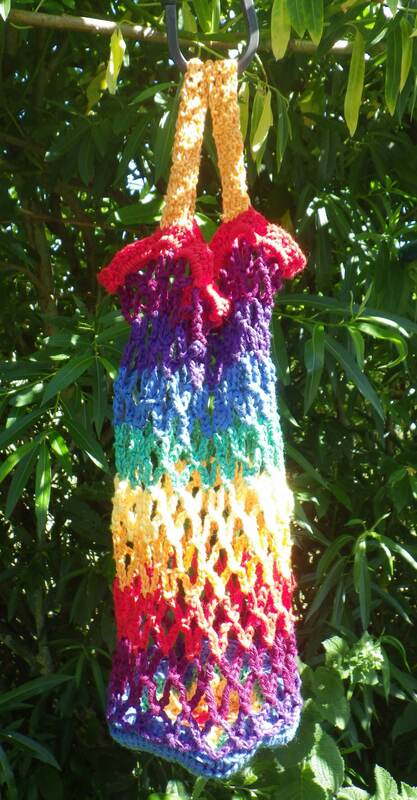 So, for example, you could make a knitting stitch sampler in the form of a scarf or a throw (afghan). My sock sampler contains all the parts of a sock: the toe, foot, heel and leg, with appropriate stitches including a rib (which I never knew you could do in crochet) and a stretchy stitch that works well for the foot part. It’s never going to be worn but it’s going to be really useful when Mrs Robinson is back up in Preston and I can’t call on her for help in person. I’m really enthusiastic about this sort of skill-sharing… we had a lovely sociable day, with lots of cups of tea, delicious food, and some tangible outputs. There really should be more of this… so, who wants to have a go at felting in exchange for teaching me a new craft or helping me improve an old one?